Designed with easy operation in mind, the single drum gripper can pick up one drum without ever leaving the drivers seat. Slips onto the forks tines and has a safety chain that attaches to the fork truck. 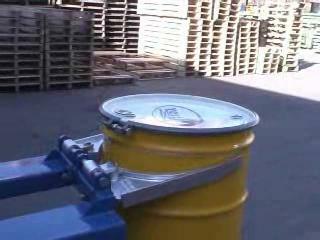 Picks up the drum under the rib and releases automatically when the drum is lowered to the floor. The fork pockets measure 2 1/2" high x 7 1/2" wide on 13 1/2" centers. Capacity for these are 800 lbs. This product can ship UPS. Costs for shipping this item will be emailed to you when you submit your order. No orders are processed prior to ship costs being sent and confirmed by you. Easily dump loaded pallets without leaving the seat of your fork truck. Use this cart for transporting drums one at a time.